In 1900, engineers reversed the flow of the Chicago River to prevent wastewater from polluting Lake Michigan and the city?s drinking supply. The feat was hailed as one of the seven engineering wonders of the United States. Nearly 100 years later, measurements revealed mysterious currents flowing toward the lake, deep below the river?s surface. Was the river reclaiming its historical path? Professor Marcelo García and research assistants pose by their model of the Chicago River in the Ven Te Chow Hydrosystems Laboratory. From left: Ph.D. student Carlos M. García, Professor García, Ph.D. student Ryan Jackson, graduate student Claudia Manriquez and Laboratory Manager Andy Waratuke. In January 1998, scientists from the U.S. Geological Survey (USGS), taking routine measurements in the Chicago River, noticed something they couldn?t explain. A measurement device located at the bridge crossing over the Chicago River at Columbus Drive had recorded a bi-directional flow in the river. At the surface, the river was flowing east to west, away from Lake Michigan, as expected. But deep below, near the riverbed, water was traveling west to east, toward the lake. This was puzzling; the city?s complex system of canals, pumps, gates and locks developed in the early 20th Century was presumed to have achieved control over the river?s flow. The water was supposed to flow from the lake into the river, except when water was intentionally pumped back into the lake to make sure Illinois was using only its fair share of Lake Michigan?s water, as stipulated by a 1980 U.S. Supreme Court decree and the 1996 Great Lakes Mediation Memorandum of Understanding. It was also troubling from an environmental standpoint; if water was flowing eastward in the Chicago River, it had to be coming from the North Branch of the river, which receives much of its flow from one of the world?s largest wastewater treatment plants. Water from the North Branch would surely lessen the water quality of the Chicago River, which has a higher use classification by the Illinois Pollution Control Board. Furthermore if that poorer-quality water was making its way from the river into the lake, either through pumping or leakage through the gates where the river meets the lake, it could potentially threaten the water quality of the lake. The odd flow was noticed during the following winters as well. During summer months, when boat traffic on the river was high and there was more traffic through the locks, the river flowed away from the lake. But in the winter months, the unusual flow returned. As Chicago-area engineers puzzled over the problem, CEE Siess Professor Marcelo García suspected he could solve the mystery. García thought the culprit might be a density current, which is a layer of denser fluid flowing underneath a less-dense layer. Density currents develop when water of different densities mixes. Water density can be affected by such factors as temperature, suspended sediment, dissolved solids and salinity. As a doctoral student at the University of Minnesota, García had studied such flows. He suspected that some of the higher density water from the Chicago River?s North Branch, rather than merging with water from the Main Stem at the junction near the Merchandise Mart and continuing down into the South Branch, was instead plunging below the surface and flowing toward the lake, creating ?a river under the river,? he says. As other engineers and scientists considered the possibility that wind currents were causing the unusual flows, García presented his own theory. It was a tough sell in the ?windy city.? ?It took me a lot of time [to convince them],? he says. ?I would go to meetings in Chicago, and I would try to explain this to people?these are engineers?and they would look at me like I was nuts.? Finally, in 2001, García and fellow researchers at CEE?s Ven Te Chow Hydrosystems Laboratory got the go-ahead to research their idea. With funding from the Metropolitan Water Reclamation District of Greater Chicago (MWRDGC) and measurements from the river provided by the U.S. Geological Survey, García and then-graduate student Fabian Bombardelli, now Assistant Professor at the University of California at Davis, built a numerical model of the Chicago River system. The resulting three-dimensional, hydrodynamic simulation successfully proved the likelihood that density currents were causing the bi-directional wintertime flow. In order to determine the conditions under which such currents might develop and ultimately find ways to stop them, García then worked with hydrosystems graduate student Claudia Manriquez and Lab Manager Andy Waratuke to design and build a physical model of the Main Stem of the Chicago River, including portions of the North and the South River Branches. Funding was provided by the MWRDGC and the Illinois Department of Natural Resources (IDNR). Other involved agencies included the U.S. Army Corps of Engineers, the U.S. Environmental Protection Agency (EPA), and the Illinois EPA, all of whom had an interest in making sure the Chicago River was behaving as intended and managed accordingly. 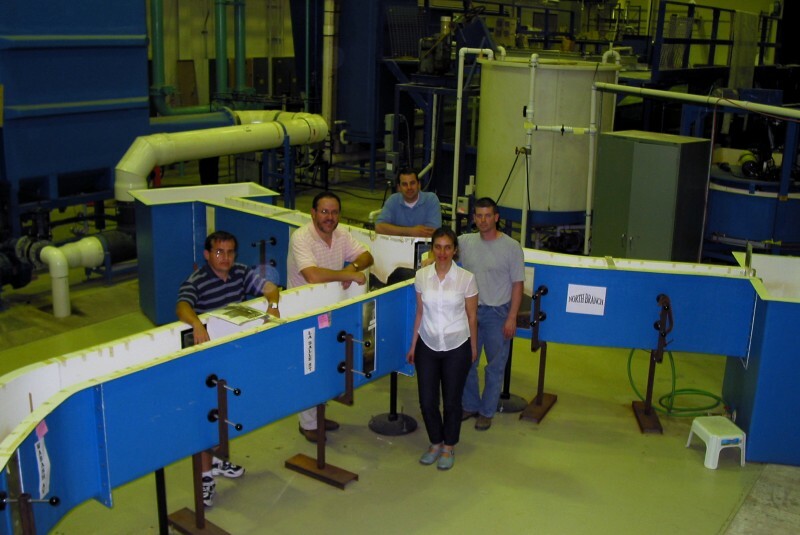 Using the model, the researchers, including graduate student Claudia Manriquez and Ph.D. students Ryan Jackson and Carlos García, convincingly proved that density currents are the most likely cause of the surprising measurements first noticed in 1998. More research is needed to explore ways to prevent such currents in the future, Professor García says. A recent analysis of flow velocity profiles measured by the Illinois District of the USGS confirmed that during the winter months, density flows develop rather frequently in the Chicago River; eight such events were recorded during January 2004. ?What is unbelievable is that everybody had thought for 100 years that the river has flowed away from Lake Michigan, but the river has not lost its memory,? García says. ?This shows that if the river had a choice, it would still flow toward the lake.? Is there a lesson for engineers in the river?s refusal to cooperate? García thinks so, and his answer hints at one of the central truths of civil engineering: ?The lesson is that there is a lot more in the Chicago River that meets the eye. ?